Co-founded by mobile heath product guru Sonny Vu and former Apple CEO John Sculley, Misfit Wearables is already plucking at the heart strings of Apple fans with the mark's reference to the "Think Different" campaign and "Here's to the crazy ones" ad. But does the company's debut product offering achieve that unique balance of beauty and performance Apple executes so deftly? Editor's Note: This is the second in a multi-part review series featuring fitness monitors and activity trackers, the first featuring Withings' Pulse can be found here. Over the coming weeks, AppleInsider will offer pros and cons for a number of upcoming devices, as well as those currently available. Shine is undoubtedly the best looking fitness tracker we have ever seen. While we wouldn't go so far as to call it a piece of "futuristic jewelry," as some have taken to describing the small pebble-like device, Shine is quite the looker. 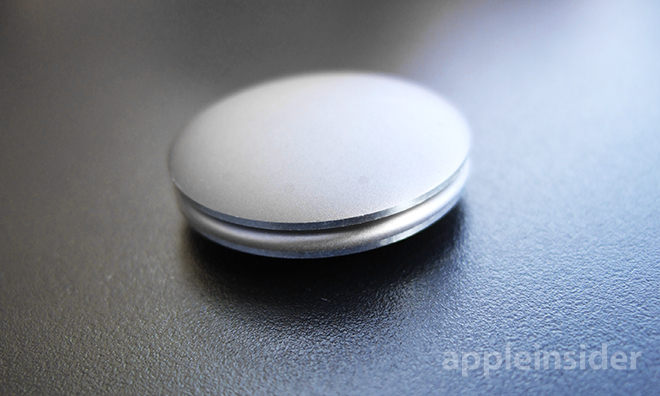 One of the first things you'll notice upon seeing the device up close is its size. In pictures, especially the extreme macro shots on Misfit's website, Shine appears to be about as large as a medium size watch face. In person, however, the unit is much smaller than we expected with a diameter just larger than a quarter. Continuing with the coin analogy, thickness comes in at about three quarters, with a slight dome and taper moving down to highly polished edges. 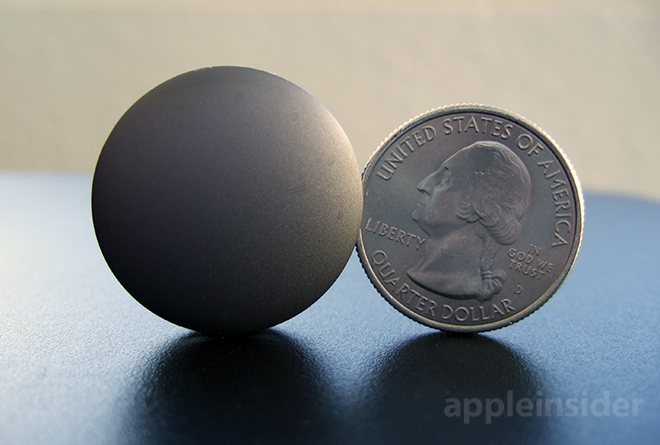 Shine is made from aerospace-grade aluminum, milled down to a light two-part shell. Embedded in the larger side is the device's circuitry, including 12 white LEDs hidden behind laser-drilled holes, a Bluetooth Low Energy module, three-axis accelerometer and processor. The surface of the unit is powder blasted and anodized for a strong matte finish. 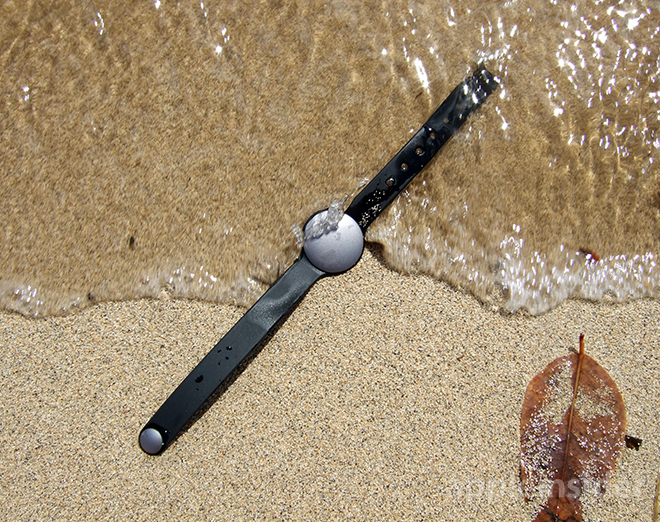 A single groove running the circumference of Shine and acts as the attachment point for the unit's four accessories: a wristband, necklace, magnetic clip and watch band. Retail packaging includes the sports wristband and clip, while the necklace and leather band can be purchased separately. Shine's battery and removal tool sit above the opened unit. 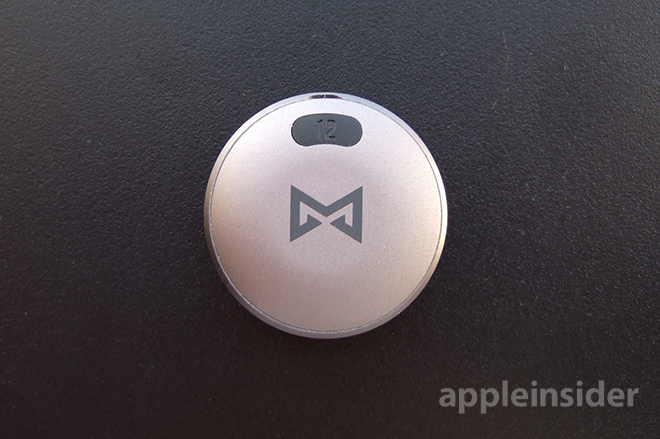 The second side of the shell is a flat battery cover emblazoned with the Misfit Wearables logo. 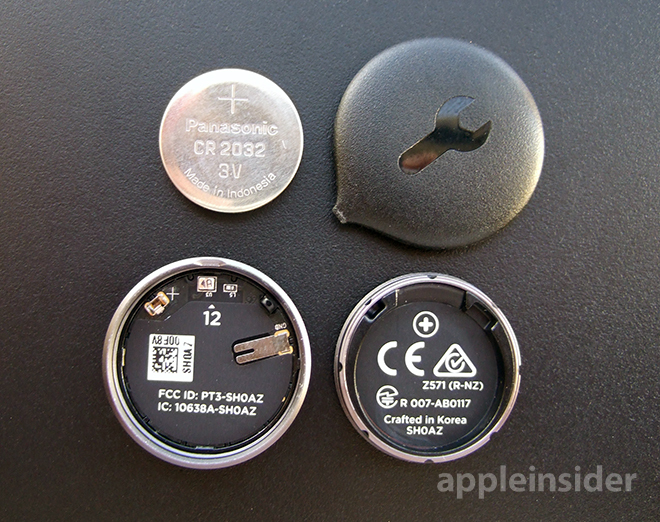 A strong magnet is built in to this section, which not only helps keep the CR2032 button cell battery in place, but acts as an anchor for the magnetic clip accessory. A rubber o-ring is also included in the bottom portion, sealing out water up to a rated 150 feet. Since Shine is designed as a symmetrical circle with no obvious markings, a small plastic insert reading "12" is embedded in the rear case to denote the correct "12 o'clock" orientation when securing the device to one of the wearable accessories. First and foremost: Shine is easy to wear. The device comes with a number of carry options that will suit just about everyone's style, including a necklace. We took the more traditional approach and used the included wristband for most of our testing. 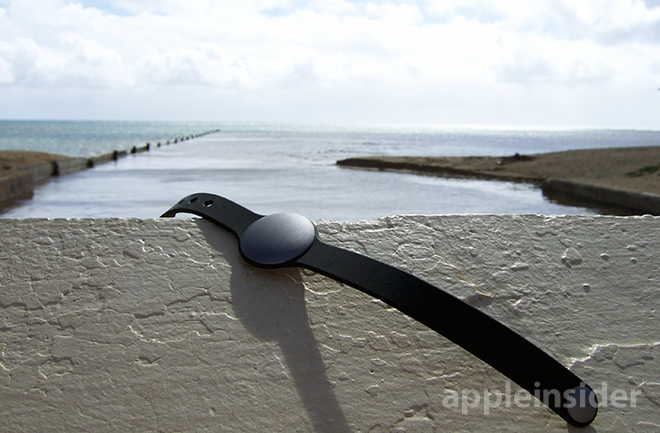 The combined weight of Shine and the rubberized sport band is negligible, to the point of being unnoticeable. Unlike other fitness trackers we've tested, Shine didn't get in the way of daily tasks, mostly thanks to its extremely low profile. In addition, the anodized aluminum withstood day-to-day use, and we only managed to scuff the surface slightly from a brush with concrete pillar. One of the more interesting aspects of Shine's operation is how the device displays data. Instead of reading off a number, the LEDs illuminate in succession like a digital fuel gauge. The more steps taken and activities accomplished throughout the day, the more LEDs light up. The idea is akin to Nike's FuelBand or other wearable products. There are two main input options: a double tap brings up a graphical representation of points earned and a triple tap tags activities. Shine can also be configured to display a clock after the progress indicator, but because there are only 12 LEDs, time is rounded to the nearest five-minute interval. 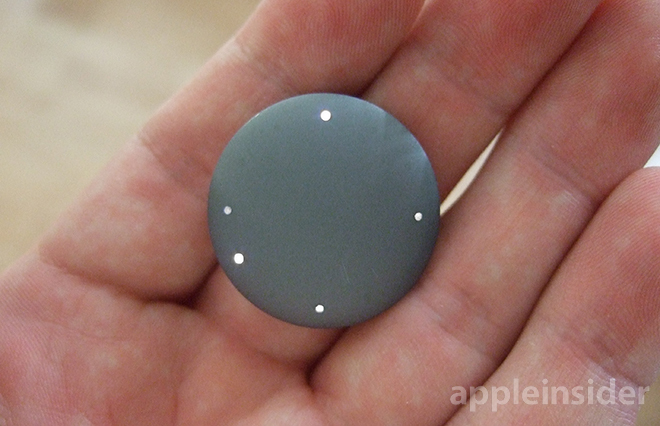 As Shine is a low-energy device —lasting for four months with a single battery —the LEDs are not the brightness and are easily washed out in direct sunlight. 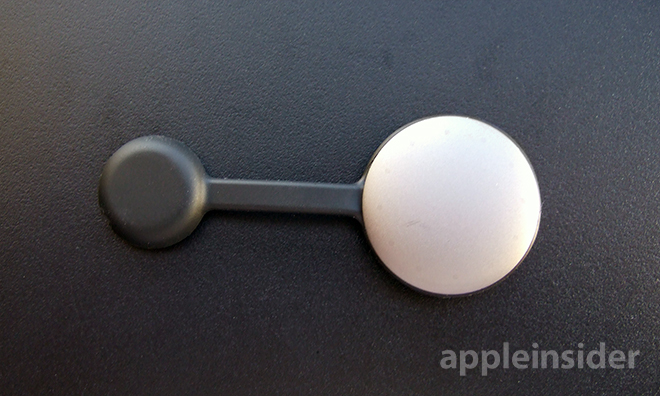 Like the FuelBand, Shine assigns arbitrary points based on a user's activity level. The low-end default is 600 points, which can be accomplished with either a one-hour walk, 20-minute run or 30-minute swim. Daily goals are set in advance by the user, who can adjust the number in increments of 100 and sync the changes with Shine. Shine's clock mode showing time as 8:00. A more in-depth breakdown of steps taken, calories burned and miles traversed can be accessed via the Shine app after a sync. The data is somewhat confusing given Shine's ability to log other activities like swimming and cycling, which do not get their own categories. Instead, it appears that those activities are lumped in with walking and running, making the metrics a kind of hybrid estimation of energy exerted. To test sensor accuracy, we used Shine exclusively as a walking/running pedometer, foregoing any tagged activities. The unit was adequately precise in all carry positions, though wearing it with the provided wristband yielded the best results. Shine has the ability to automatically enter "running mode" when a user's motion is determined to fall within a preprogrammed profile. Many devices now have this functionality built-in, but it's still nice to have for a more accurate logging cycle. In addition to normal run/walk monitoring, other activities can be "tagged" by tapping on Shine three times, which will trigger a special LED animation. Shine's multi-sport tracking method, which is still classified as a "beta" feature, is unique in that a user is only required to start a tagged session. No further intervention is needed to end the tag, as the device will intelligently mark the time when it determines the activity is complete. Unfortunately, tags must be prepared in advance through the app, making the feature much less convenient. For example, we had to manually open the app, navigate past two menus to reach the list of tag-able activities, then click save. There is currently no way to retroactively tag a session. This is especially burdensome when using Shine's sleep tracking mode, which is categorized as one of the aforementioned tags and must be selected before going to bed every night. That being said, sleep monitoring is particularly well suited for tagging, as we often forget to turn off the feature with other devices. Getting there might be an issue, but tagging is actually useful. Each activity has its own sensor profile, meaning Shine uses software algorithms to accurately log movement across a diverse selection of sports. Currently, cycling, swimming, tennis, basketball and soccer are supported, though Misfit says more are being considered. We were most excited to try out Shine's in-water capabilities, as only a few consumer fitness products tout waterproof designs, much less actual support for water sports. More expensive, purpose-built products can be had for serious training, but Shine is one of the first mainstream devices to offer a form of swim tracking. Tapping Shine three times, we activated the "swimming" tag and went a few laps in the pool. After a couple sessions, we noticed that Shine would incorrectly classify certain strokes as "more intense" than others. For example, a spirited session of breast stroke would be deemed less active than a few laps of lazy backstroke. While water sport accuracy is not of the same high standard as on-land readings, at least Shine can count swimming toward a user's daily point goal. 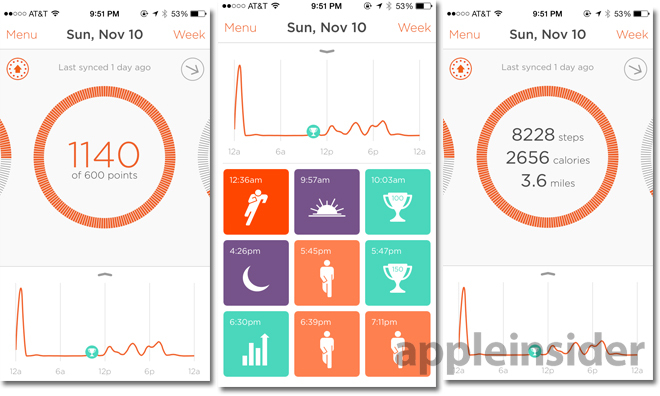 As with other fitness monitors, Shine relies heavily on its accompanying iOS app for data readout, hardware settings and more. Syncing is accomplished via Bluetooth LE and must be done manually to record statistics. The app itself is nicely designed, but we found the included measurement tools to be somewhat lacking. As seen above, data is shown in points with activity represented in graph form. Icons are used to denote activities and achievements, like "kinda active" running or "goal hit." Selecting an icon will plot the milestone on the graph and reveal how much time was spent on the given activity, as well as how many points were earned. Tapping on the points graphic will offer a bit more information regarding the "steps, calories and miles" data points mentioned near the start of the review, but this information is still quite barebones. Although the app is well done, certain functions feel unnecessary. One major "feature" that stands out as particularly excessive is syncing. 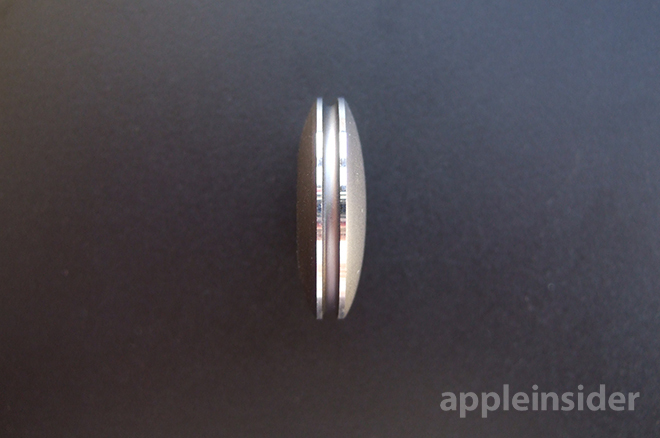 The app asks users to place Shine on the iPhone's screen to sync, which initiates an animation of concentric circles pulsing out of the device. Although it keeps the unit within Bluetooth LE range, the process is a hassle. Instead, we took to touching the screen with our finger and leaving Shine attached to our wrist. Shine could be one the most aesthetically pleasing fitness trackers out there, but it is certainly not the most feature rich. Data logging of secondary activities is useful, but we were disappointed with the tagging mechanism's implementation. Retroactive activity tagging would go a long way in making Shine more useful. The point system works well enough and we believe is adequate incentive to get casual users moving. 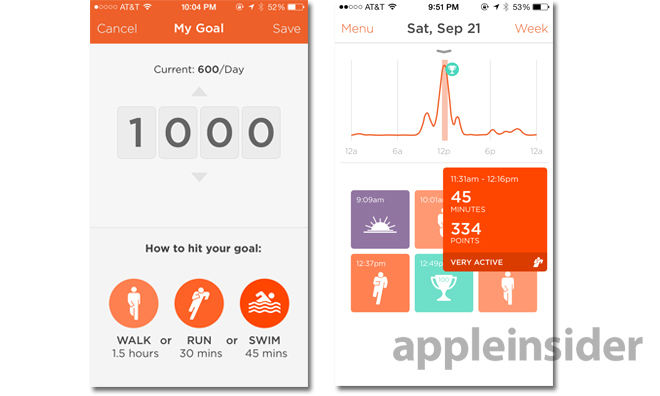 In fact, prospective buyers looking for a minimalist activity monitor with an equally spartan app would be well-served by Shine. On the other hand, power users who keep a constant eye on detailed metrics and want hardware with all the latest bells and whistles should look elsewhere. Functions, features and measured data are not at the same level as competing products, and for serious sports monitoring, the device makes too many concessions in the name of good looks. In the end, however, Misfit has accomplished what it sought out to do with Shine: make the wearable fitness monitor an attractive accessory for common consumers. Shine is priced at $99 and is available in Grey and Jet black, as well as Best Buy-exclusive colors Topaz and Champagne.